Boy oh boy, lots on my mind today! Thank you for joining me in strawberry picking. We tried to do this last week, but ended up showing up at the strawberry patch on the wrong day, and it was closed. We made it today though! Had a great time with Magdalene and Austin, picking among the many, many rows. Wish I would've gotten a picture, but I think there's something to be said for leaving the camera at home and simply enjoying the experience. I may be taking this out of context to apply it to the verse, but the Lord points out that there will be conspiring men which will have evils and designs in mind to put into play among us. I'm sure these strawberries likely grew with the support of sun, rain, good soil, and some added fertilizer. In fact, they probably also had some great pesticide ("pest" meaning unwanted critters, "icide" seeming to denote death), since during the hour+ that we were there, I only found one living critter. It was a teeny, tiny baby slug of some kind, enjoying eating the strawberry. I showed it to you and then placed it back among the other strawberries to enjoy. 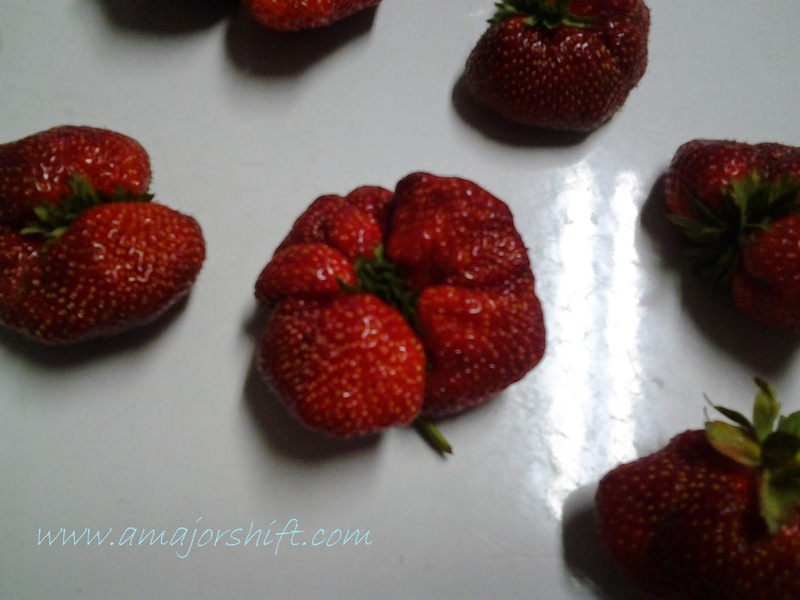 Anyways... this looks like a Three Mile Island strawberry. At least 15% or so of what we picked look like this triple- or quadruple-berry strawberry mutation. Is this safe to eat? Surely it must not cause stomach ache or other issues. But why are there seemingly 3-4 points on this one? What makes the cells grow this way? What will this do to my body, if on a DNA level, this berry is altered? Is this the result of fertilizer, pesticide, or years of hybridization of the plant? Is this intended to create ease of picking, or cause awe and great interest, thereby bringing in increased revenue? Or is it an unintended consequence of the chemicals applied to help it grow? Certainly food for thought. Yes, there are no bugs on it (beyond the baby slug), and I hand picked it, so that seems to give an air of being organic. But this definitely does not appear to be organic, unless that equals the appearance of a mutation of what a strawberry is supposed to be. Eat with care! I'll pray the mutation stops with the strawberries, and that we can take care of these bodies we have been so blessed to have!